Intentional jewelry allows the Maker to continually perfect one's craft while having a sense of play. This piece started with the matte lace agate as the inspiration for a "sensory cuff" for an artist. Something with weight, texture, glitter and edge. Something with weight, but also comfortable as a stack. Named after one of the most creative, spirited beings I know. I chose star cut millefiori in goldstone because I love the sparkle. I had never seen these beads before and I found only a few of them at a traveling bead show that came to town. It was love at first sight. 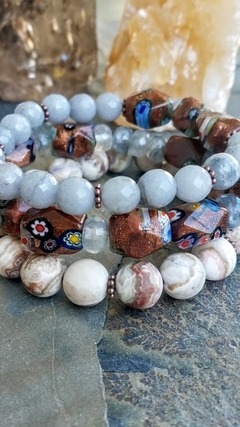 I included also one band made of smooth matte lace agate in a chunky size - 10mm. The softest gray colors bring the piece together. It's sized about a 7.25 inch for a once size fits all. It will drape nicely at the wrist bone on a smaller wrist or hug the wrist on a larger bone. Goldstone is a man-made glass that has copper flecks suspended in it. This gives the stone the illusion of sparkle. Known as the Stone of Ambition, Goldstone can help you achieve your goals with persistence and determination. No goal is too big or too small with Goldstone. When you decide that you want to achieve something, Goldstone’s energies will work with you to make it happen! Millefiore is a glasswork technique which produces distinctive decorative patterns on glassware. The term millefiori is a combination of the Italian words "mille" (thousand) and "fiori" (flowers). Milefiori beads have been uncovered from digs dating apparently from the late 5th or early 6th century. Crazy lace agate (also known as Mexican Agate) is young in comparison to many other minerals on Earth. 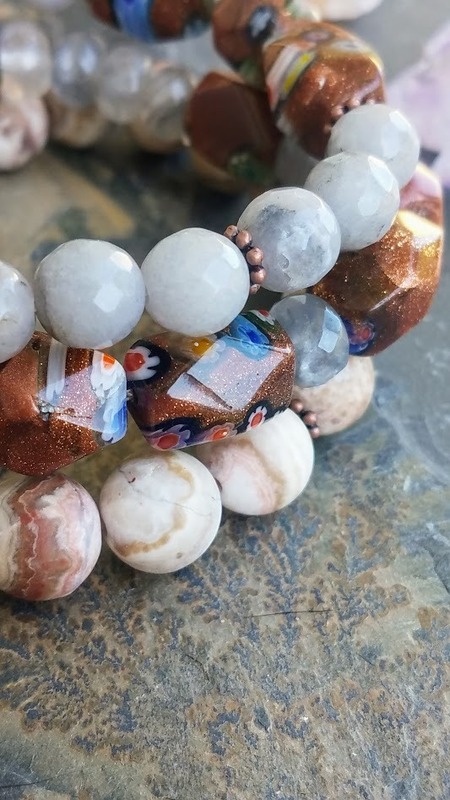 Found exclusively within the area known as Chihuahua, in Northern Mexico, this lacy agate is known not only for its stunning banded patterns, but its powerful healing energies as well. Crazy lace agate is believed to have been created in the cretaceous period, about 65-90 million years ago. 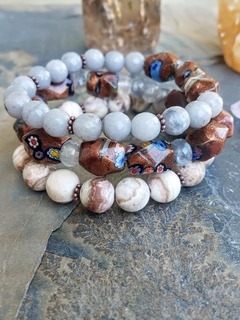 Crazy lace agate helps to increase one's energy and encourage concentration so that one can stay on task and complete goals much easier. It is said this stone promotes inner stability, composure and maturity and its warm protective properties encourage security and self-confidence. Gray Jade is the ultimate "Dream Stone," revered in ancient cultures, as well as today, to access the spiritual world, gain insight into ritualistic knowledge, encourage creativity, and dream-solve.It is cherished as a protective talisman, assuring long life and a peaceful death, and is considered a powerful healing stone. An amulet of good luck and friendship, Jade signifies wisdom gathered in tranquility, dispelling the negative and encouraging one to see oneself as they really are. Gray Quartz honors its connection with Mother Earth. It is a talisman of the Root Chakra, an anchor in the natural world, drawing white light energy from the Crown down through the body to be deeply rooted into the physical plane. It initiates movement of primal forces within the body and activates one’s survival instincts in a purified way. It brings strength and stability, and a sense of personal pride in walking the Earth and inhabiting a human form. 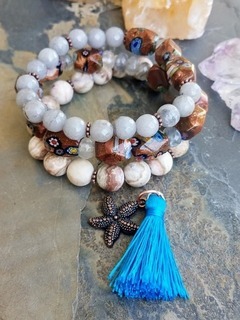 ** starfish + tassel can be added as an option - it will be attached to the 8mm bead bracelet.